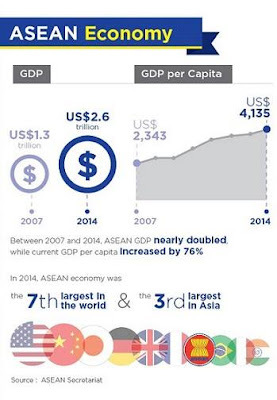 Today, the ASEAN Economic Community (AEC), one of three pillars of the regional grouping, materializes. It further cements what has been initiated several decades ago, to have a single production base, a single market, moving towards a single rate of tariff (zero for member-states) and low rates for imports from non-ASEAN countries. Despite bureaucratism that delays real free trade, the region and the rest of the world is generally marching towards global free trade. I like this photo, colorful and it shows the cultural and national diversity among the people of the 10 member-countries. 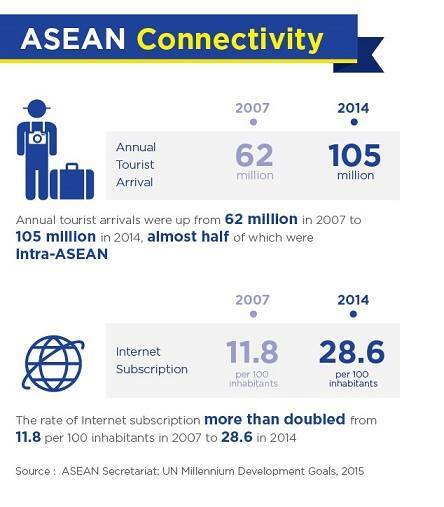 2015 -- ASEAN Community. Economic Community, Political Community, and Social-Cultural Community. Some macroeconomic data of the region and its 10 member-countries. Within seven years, both the overall GDP size and per capita GDP income has almost doubled. Third largest economy in Asia, after China and Japan. Another good set of data, connectivity in the region. Internet subscription has more than doubled within the past seven years, wow. This is not to say "All Halleluiah" to the 10 governments of the association. Economic integration and free trade is the "default mode" of humanity if government trade regulations, protectionism and taxation is absent. Nonetheless, compared to other regional groupings and economic communities in Asia (say compared with South Asian countries) and other continents, the pace of trade liberalization and economic deregulation in the ASEAN is faster. Thus, credit be given when its due to member-governments. Happy new year once again. Free trade and prosperity. All photos above taken from ASEAN facebook page. Despite all the negative news, stories and analysis of the world and many countries, the world is actually getting better, more peaceful, have less famine-related problems. Human progress continues, human prosperity expands, despite climate alarmism and health worryism that also expands in many sectors of the planet. for some leads. If I have more time to search, this list can have minor change but this is fine already. 1. 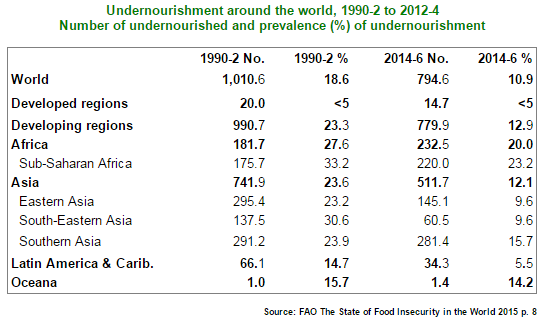 Proportion of the world’s population that is undernourished decreased from 19 percent in 1990 to 11 percent in 2014. 2. 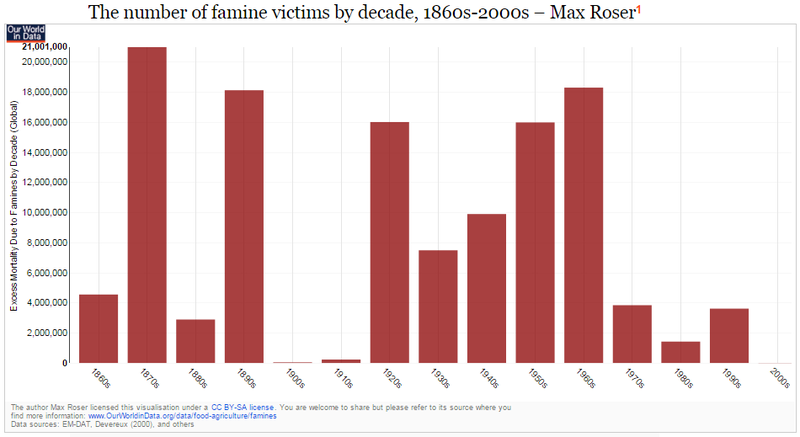 World famine is declining. The nearly 4 million victims are mostly from only 2 countries – Somalia (0.3 to 0.5 M) and N. Korea (2.8 to 3.5 M). 3. 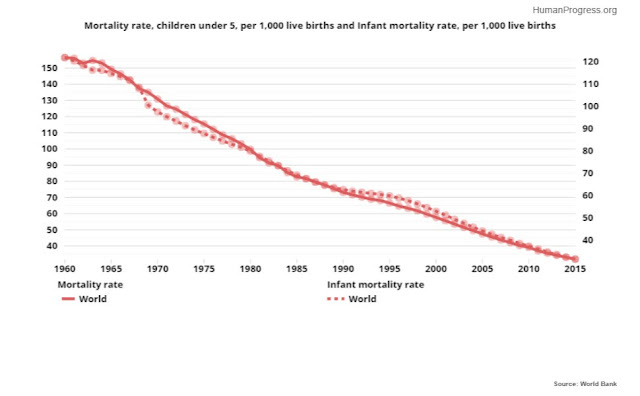 Child mortality rate has declined by around 50 percent between 1990 and 2015. Similar trend in infant mortality. The year is 2025. You're sitting in a surgery watching your doctor carefully insert the tips of her fingertips into black thimble-like actuators. A screen in front of the doctor flashes with the image of a glistening tunnel of flesh and, as she huddles over the controls, you feel a stirring in your bowels. The gelatinous mass you feel coming to life inside you found its way into your body 24 hours earlier, when you swallowed a pill that looked unremarkable, save for its bulk. That pill was actually a package of edible electronics, a miniature robot that will allow the doctor to feel inside your body without making a single incision. This is the coming world of augmented humans, where technology gifts people senses, skills, and strengths never before available. Merck CEO Kenneth Frazier said the company has found, based on new data released over the weekend, how its immune therapy drug Keytruda may help to fight advanced lung cancer. The world's first malaria vaccine has cleared one of the final hurdles prior to being approved for use in Africa. The European Medicines Agency gave a positive scientific opinion after assessing its safety and effectiveness. Malaria kills around 584,000 people a year worldwide, most of them children under five in sub-Saharan Africa. Mosquirix, otherwise known as the RTS,S vaccine, is the first against a parasitic infection in humans. Dr Ripley Ballou, head of research at GSK vaccines, said: "This is a hugely significant moment. I've been working on this vaccine for 30 years and this is a dream come true." They liken the gene network to a football team. When all the players are in the right positions, the brain appears to function optimally, leading to clarity of thought and what we think of as quickness or cleverness. However when the genes are mutated or in the wrong order, it can lead to dullness of thinking, or even serious cognitive impairments. The WB and other government multilateral/foreign aid agencies can argue that it was because of "more government" that poverty has declined. Maybe yes, but likely not. Why? Because it's always the endless innovation in the private sector -- often curtailed by endless permits, taxes and bureaucracies -- under a competitive environment, that fuels those new inventions in healthcare and other sectors of the economy. 10. 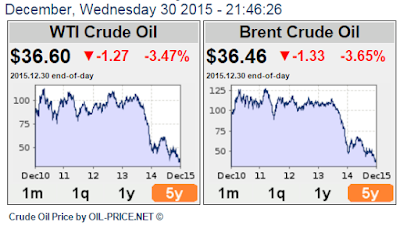 My favorite -- declining and staying low, world oil prices. More enterprise competition and innovation, less government taxes and bureaucracies, they are the key to sustain global peace and prosperity. A happy and prosperous new year 2016. This year, things have been generally good for me. Let me enumerate a few things. Last March, I was officially appointed as a SEANET (South East Asia Network for Development) Fellow by IDEAS' CEO and SEANET Director, Wan Saiful Wan Jan. My appointment as Fellow is from March 2015 to December 2016. Thanks Wan. Last September, I was also made a Fellow of the Stratbase-Albert Del Rosario Institute (ADRi) by its President, Prof. Victor "Dindo" Manhit. Prior to that, I have written about three papers for Stratbase which they published and distributed to their friends and clients. Thanks Dindo. 2. Five Asian Trips, conference/workshop. a. January, I attended the 3rd Asian Liberty Forum (ALF) held in Soaltee Crowne Plaza, Kathmandu, Nepal, sponsored by the Asian Center for Entrepreneurship (ACE), Center for Civil Society (CCS), and Samriddhi Prosperity Foundation. ACE and CCS are Delhi-based while Samriddhi is Kathmandu-based. Thanks Charu, Parth and Robin. See ALF 2: Opening Dinner Program. 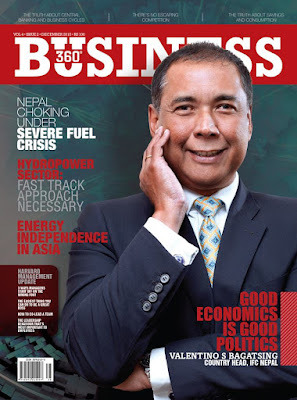 My plane fare was sponsored by Media 9/Business 360, where I have been contributing a monthly article for almost 2 years with them. CCS and Samriddhi sponsored my 3 nights hotel stay at another hotel. b. April, I was one of three speakers in a panel discussion on economic liberalization and the poor in the ASEAN, during the ASEAN People's Forum (APF) in Kuala Lumpur. My trip was sponsored by IDEAS. See Workshop on Trade Liberalization at the APF 2015, Kuala Lumpur. c. October, I participated in the "ASEAN Scenario Workshop" held in Bangkok, Thailand. It was organized by the Siam Intelligence Unit (SIU) and the Heinrich Boll Stiftung (HBS). My trip was sponsored by the two event organizers. See SIU-HBS ASEAN Scenario Workshop in Bangkok. d. November, I was one of four speakers during the launching of the International Property Rights Index (IPRI) 2015, and forum on IPR and the Trans Pacific Partnership (TPP), Kuala Lumpur. The event was organized by the Property Rights Alliance (PRA) in Washington DC, and IDEAS. My trip was sponsored by PRA. See Growth, IPRI 2015 and the TPP. e. November, I participated once again in the annual Economic Freedom Network (EFN) Asia, held in Taj Tashi Hotel, Thimphu, Bhutan. The event was organized by EFN asia (Bangkok-based and the QED Group. EFN Asia along with other foreign participants, they also sponsored my trip. See Successful Conference 2015 has ended. Around July, I contributed a weekly article at the BWorld Weekender. Then in October, I got a contract to be a columnist in the Opinion section of the newspaper. I also got a few, short-term research projects with friends on various topics. Friends and readers, thank you for visiting this site. 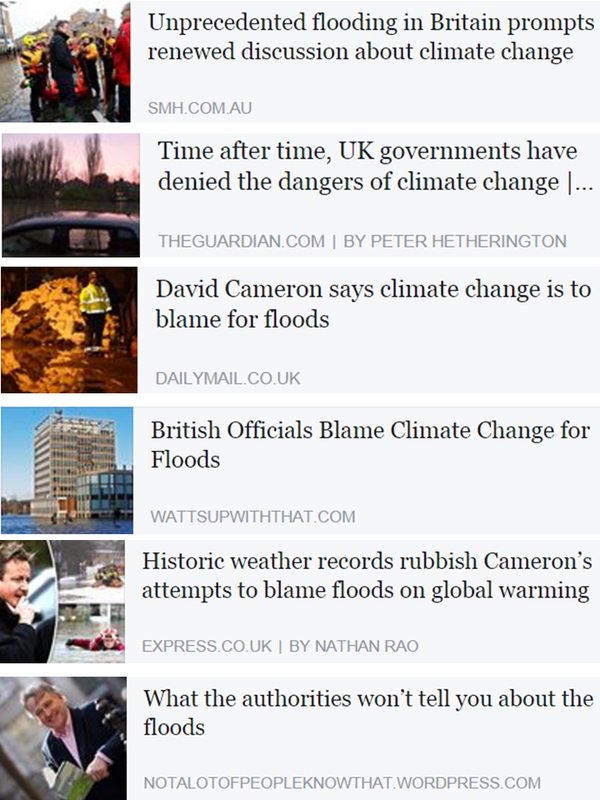 Climate Tricks 47, Severe UK flooding due to "man-made" warming, climate change? Never fails. Less rain or more rain or no rain, less flood or more flood or no flood, less storms or more storms or no storm, they are ALL proof of "man-made" warming and climate change. tsk tsk tsk. In the recent heavy flooding in the UK, some officials blame "man-made" global warming (GW) and climate change (CC), not their policies that discourage regular dredging of silted rivers. From another heavy flooding just two years ago, they have an idea already that their existing flood defence system was insufficient, meaning they can anticipate another round of heavy flooding, yet they conveniently blame "man-made" CC. Why not also blame "nature-made" CC so they can plan and act more realistically, rather than alarmingly. (1) “Climate change is forcing England to re-assess its flood defences in the face of unprecedented river level surges, one of the United Kingdom government’s most senior environment officials says. * Ministers reduced funding on defences before severe flooding in Cumbria a year ago forced them to reverse the cuts"
(5) "DAVID Cameron has sparked outrage by blaming Britain’s flood crisis on global warming while admitting defences are not fit for purpose. However experts branded his comments “ludicrous excuses” blaming lack of investment on flood defences for the disaster and pointed to historic flooding which pre-dated global warming. 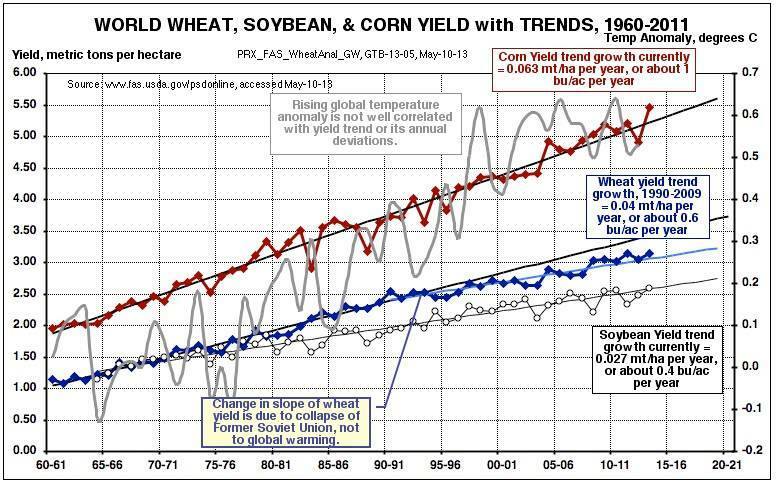 Because people are expecting or been fooled by the UN of "more warming" of 2C or 3C or higher, they cannot prepare for global cooling. 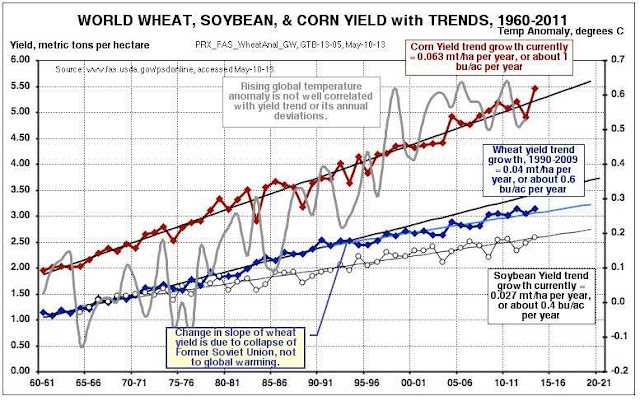 The UN (and Al Gore, and di Caprio, and WWF, Greenpeace,...) is very shrewd to announce that no rain/drought or more rain/flood, are both proof of "man-made" warming/CC. Wake up guys. Frequent less rain/drought is proof of global warming. Frequent rains/flood is proof of global cooling. The same here in the PH. Yearly, many municipalities in Bulacan and Pampanga provinces are heavily flooded, until about last week. Why, the rivers are heavily silted with lahar that continue to flow down from Mt. Pinatubo, and will continue for the next 20 years or more. But the PH government would rather spend on maintaining a CCC bureaucracy, sending many climate, environment, science, Malacanang and other officialsm to various UN and related global and regional climate meetings, climate conferences, etc. Instead of spending the money to do huge, large-scale and continuing dredging of these heavily-silted rivers and creeks. Some municipal governments in Bulacan spend big money raising the roads, up to 1 meter high. 1. "Less flood or more flood or no flood, they are proof of 'man-made' warming and climate change and hence, government must send more money to favored renewables, to climate officials, to the UN,..."
2. "Mr. X has less money or more money or no money, it is proof that he is poor and hence, government must subsidize him and his family (more CCT, free PhilHealth & medicines, free education & books,...)." As always, “man-made” or anthopogenic GW/CC is a big excuse and alibi for more environmental and energy regulations, more and bigger governments, bigger UN, bigger multilaterals and foreign aid. So this movement cannot and will not accept that GW and CC is natural and cyclical, that it is "nature-made", largely or entirely. GW and CC should be "man-made" so that "man-made" solutions and regulations can be imposed. The ultimate goal is global ecological central planning, global climate and energy socialism. Human population, whether rising or declining, should be left as individual and parental decision and responsibility, not government decision and responsibility. Should there be population explosion or population control/depopulation, it should not be government-sponsored. Thus, in ageing societies, instead of government giving subsidies to households for having new babies, government can reduce income taxes, relax rigid labor laws, so that people will have more money for their kids, or they can hire a nanny to help them raise kids. In countries where the growth of population is flat or declining, there are two solutions: have more robots, or have more migrants. Welfarism is an ideological enemy of free migration. Here are some old news reports. (1) "Germany's 82 million residents will dwindle to 74.7 million by 2050 and their average age will rise to nearly 50, assuming unchanged levels of migration, according to EU statistics agency Eurostat. Some projections are even more dire, putting the German population as low as 65 million by 2060. At present, the age dependence rate is 27.5 on average in the 28-nation EU, but Germany and Italy are well above that level. The rate is projected to jump to 49.4 in 2050, when there will be only two people of working age for every retiree. Most EU countries have raised their retirement age to 65 or beyond and are making citizens contribute longer for a full pension - but further increases lie ahead." (2) "Globally, an estimated 44.4 million people suffer from dementia and the figure is projected to triple to 135.5 million in 2050 as the population ages, Alzheimer’s Disease International estimates. Nowhere is the problem more acute than inJapan, where an estimated 8 million people have dementia or show signs of developing it. By 2060, 40 percent of Japanese will be over 65, up from 24 percent today, according to National Institute of Population and Social Security Research. (3) "Japan's birth rate hit a record low in 2014 at just 1,001,000 infants. When combined with 1.3 million deaths in the same year, that's a deepening population crisis. According to Japan's population institute, the overall population could dip to 107 million by 2040 — or 20 million lower than today. At the same time, Japan's population is shrinking and graying, setting up a "demographic time bomb" that could radiate out globally through the country's Greece-level national debt and deep economic ties with China and the US." July 1, 2015. (4) "Despite an explosion in population greater than Malthus could have ever imagined, global living standards are higher than ever. .. the precautionary principle, which this book rightly castigates. Based on a confusion between the sensible precept “be careful” and the nonsensical proposition that you can’t be too careful, it insists on taking the worst-case scenario as the outcome that should dictate policy. On that basis, one would never get in a car. And the massive technological advances that we have seen since the Industrial Revolution, and the reduction in global poverty that has followed, would never have occurred. Another factor is the quasi-religious appeal of these prophecies, which may help to explain the papal encyclical to which I referred at the start. Even more recently, the Church of England at its latest synod called for all vicars to be trained in “eco-theology” as well as the Bible. It also called for churchgoers to do without lunch on the first day of each month, as a fast against climate change. Perhaps this should not be mocked: It might help combat obesity, which is probably more damaging than climate change. “The End of Doom” is not quite in the same class as Matt Ridley’s classic, “The Rational Optimist,” but it is a good book and deserves to be widely read." July 27, 2015. (5) "Only 1.001 million babies were born in Japan in 2014 — a record low — and 1.269 million people died. That's an overall loss of 268,000 people, and a signal of a population crisis in one of the world's most developed and debt-ridden economies." 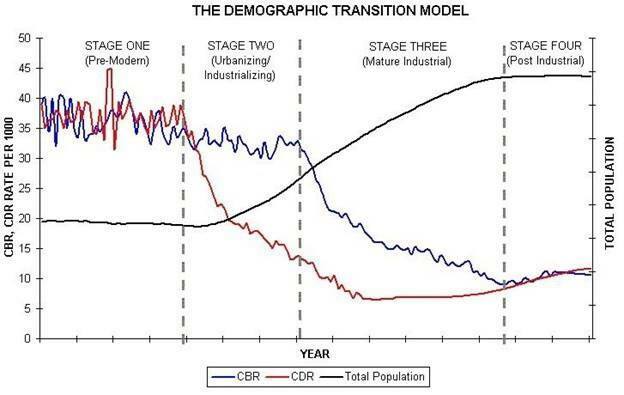 "TCOR and later UNEP’s Agenda 21 adopted and expanded the Malthusian idea of overpopulation to all resources making it the central tenet of all their politics and policies. The IPCC was set up to assign the blame of global warming and latterly climate change on human produced CO2 from an industrialized expanding population. They both developed from false assumptions, used manipulated data and science, which they combined into computer models whose projections were, not surprisingly, wrong. The result is the fallacy of global warming due to human CO2 is a subset built on the fallacy of overpopulation." Japan depopulating, something like 100,000 to nearly 300,000 people a year. Japan will be forced by circumstances to have more migrant workers, and/or more robots. The same thing will happen to China. So the China commie government should be more realistic now -- it should not alienate big population countries like India, Pakistan, Bangladesh, Philippines and Vietnam. Soon, these 5 countries will supply many of its manpower requirements. Or it may accept more people from Nigeria, Ethiopia, other African countries. Migrant workers will eventually flood in, Japan will have no choice. Between ageing Japanese with dementia who cannot find their way home, would walk and get lost in the cold and die, and get foreign workers to take care of their ageing parents and grandparents, the latter should be preferable to more Japanese. Liberalize travel and migration, relax those work visa restrictions. We should be moving towards a globalize and borderless world. That is what the Maddison data show -- as human population expands, as they move from one country/continent to another, to improve their lives and the new communities they adopted, per capita income rises. Visa restrictions and border sealing were 1900s thinking of governments that persist until now. But further human modernization, FTAs among countries, and demographic realities will force those governments to slowly tear down those strict border restrictions. 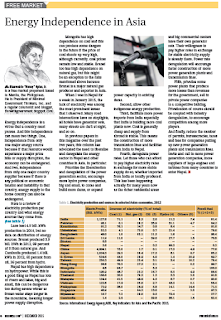 My previous article in BWorld on Solar power and supply instability attracted various comments from friends and strangers. A socialist friend posted my article in his fb page, because they hate capitalism and fossil fuels. One of his anti-fossil fuel friends made long comments criticizing my paper. When I came in and asked for his charts and numbers, at first he sustained his statements but later chickened out. Here's the chart and numbers that probably made him realize that subsidize-renewables lobby is standing on a weak ground. Germany's installed solar capacity in 2014 was 38,200 MW or 38.2 GW. Assuming an 18% average capacity factor, it should produce 6.88 GW. then it should produce around 165 GWH/day on average. 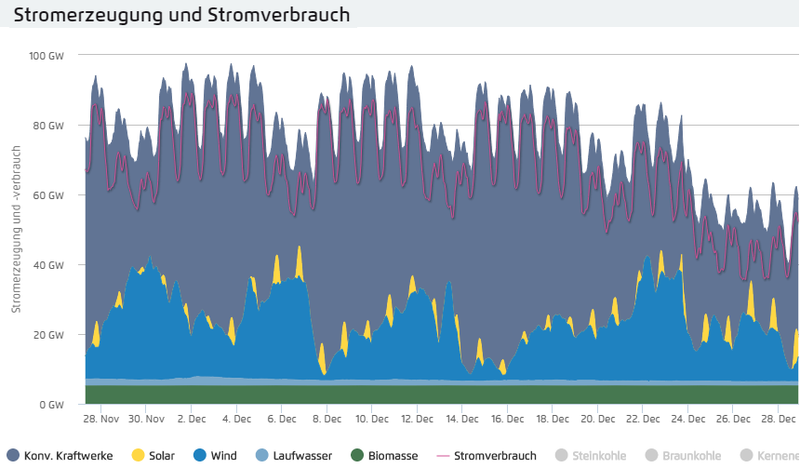 Look at the chart for the past 30 days, actual electricity production in Germany until early morning today December 28. Those yellow blips producing up to 10 GW and running only for a few hours a day. And the German energy consumers pay a lot of subsidies for solar and wind. The more useful and reliable renewables for Germany are hydro and biomass, the bottom 2 in the chart. For the PH, it is big hydro and geothermal. From what I read once, Poland, France, others want Germany to be removed even partially from the European grid. Why? surges from their wind power. When there is a surge in wind output as they have high wind installation capacity, Germany cannot absorb all output, so they export the huge surplus energy to the European grid, and this causes huge instability in their system, courting possible brownouts due to high supply relative to demand. One solution of Germany is to tell some of those wind farms to stop producing electricity, and still get paid. So Germany's feed in act or FIT is weird. They even pay for electricity not produced or killed when there is a surge, whereas here, the FIT applies only on electricity actually produced by the new renewables. Lesson: governments should get out intervening too much on energy pricing and giving out subsidies. I also got a comment from one reader. This was published by BWorld under the Feedback section last week. I liked your article in today’s paper about the problems with solar power. Ironically the Star published also today an article about the solar plant at SM North EDSA which you mentioned in your article. It states in there that the 1.5 MW solar plant will provide enough power to “energize 1000 households” . That is a gross exaggeration! At a capacity factor of 15% which reflects the Philippine true weather conditions and given an average power consumption of 2560 Kwh per year for a typical Philippine household this plant would provide at best power for only 32 households if it could supply baseload. In don’t understand the hype and misleading reports about the benefits of solar. It may be a different story if you have desert climate conditions like in Southern California or the Middle East where solar under an all-year-round clear sky can reach capacity factors of 25% and merchant solar plants can feed their intermittent supply to a large grid. None of these conditions exist here in the Philippines. You mentioned in your article the often very short interruptions which occur within minutes. The industry calls that “Power-Swings” . The other day a heard a speaker at a congress who reported that unless one has huge warehouse-like battery storage facility, which can buffer these power swings, our fairly small capacity grids cannot absorb these swings and will automatically shut down. Very scary. As a German Citizen I am of course proud of the accomplishment we have achieved in terms of RE. In the enclosed presentation which I gave at a Energy Forum you can see that the total power generated from RE sources was 152 GWh in 2013. That is double the power output of the entire Philippine in that same year! But solar is playing only a limited role in Germany. Aside from wind it is biomass which is the backbone of German RE sources. A total of 7.800 small biogas plants all over the country with a total capacity 3800 MW are generating 29 GWh per year while the Philippines power output as a total is 74 GWh per year. According to a study from the USAid the Philippines have organic feedstock potential for a total of biomass/biogas output of 4,450 MW! That is the equivalent of 10 coal power plants! Anyway I believe that the solar industry will soon learn a hard lesson and will realize that its application on an island nation like the Philippines will be limited. Labels: feed-in-tariff, renewable energy, solar energy. 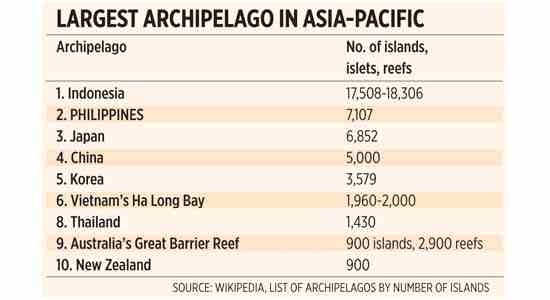 The Philippines is the second largest archipelago in Asia-Pacific in terms of number of islands and islets, next to Indonesia. Air and sea travel therefore is very important for many inhabitants of different islands. Continued modernization of existing airports and seaports and the creation of new ones is a must. 5. Car -- Caticlan, Aklan to Iloilo City (around 210 km). Batangas port, operated by the Philippine Ports Authority (PPA), was congested that day with vehicles going to Calapan, Oriental Mindoro. Inside the gate, there was another long queue of cars. Guards said there were many cars already queuing inside for all boats going to Calapan. Buses are given priority to board the boats. 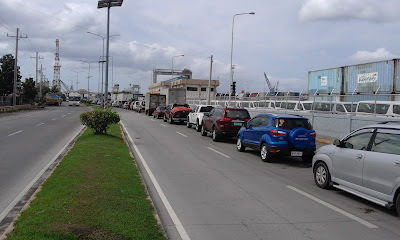 This photo shows the queue of vehicles planning to enter Batangas port to go to Calapan, Oriental Mindoro on Dec. 20. After waiting for about 30 minutes in this area where the queue was hardly moving, I decided to go to Mindoro via Puerto Galera as there was no queue for vehicles. Before loading the car to a roll on, roll off boat going to Puerto Galera, a friend who is working at Fast Cat shipping line called me and said that he can accommodate us in their next boat which is bigger, faster and more modern. Another staff of Fast Cat said that their boat which left 12 noon for Calapan was not full and that they could have accommodated up to 10 cars more so he wondered why the guards held up so many cars at the gate saying that boats for Calapan were already full. The Fast Cat boat was supposed to leave Batangas at 2:30 p.m. but it arrived late. When the boat was already full with vehicles and passengers, the boat was not allowed to leave with standing passengers because authorities wanted everyone to be seated. It seems a suspicious decision because all the buses that came were full and have many standing passengers in them as this is the holiday season. Helpless to argue with the coast guard, the crew asked the excess passengers to go back to their buses. We then finally left Batangas port at almost 4 p.m., a few hours delayed. My friend commented that the coast guard does not or seldom implement strict rules on older shipping lines. It was already evening when we arrived Calapan. Many parts of the city, the surrounding municipalities were dark, some areas looked eerie. The destruction of the recent strong typhoon were still evident -- lots of fallen and uprooted big trees, fallen or leaning electrical posts, many houses destroyed, dark roads and standing houses. Bulalacao is the last town of Oriental Mindoro in the south; next to it is San Jose, the capital of Occidental Mindoro. The road from Roxas to Bulalacao was surprisingly very smooth and modern. I did not expect to see such smooth road when it’s far from the capital, Calapan. 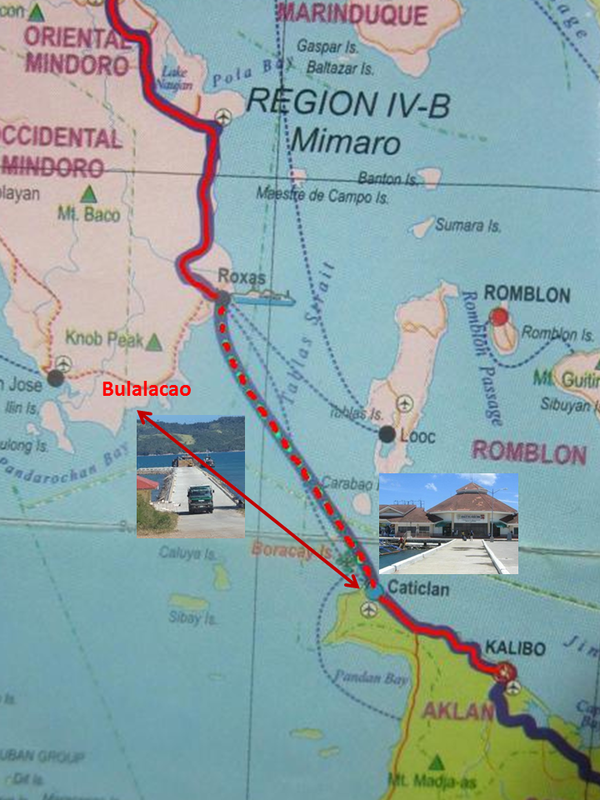 Bulalacao port is very basic -- no passenger terminal, only the boat anchored and vehicles entering it. The shipping line’s ticket office, PPA and coast guard stations are in a temporary structure at the gate. Since this is a new and lesser known port, there are not too many vehicles that board here. The bureaucracy and inspections are minimal. As a result of the trip, I have learned several lessons and have come up with possible policy reform suggestions. 1 The PPA seems to remain inefficient in handling or facilitating big volume of vehicles that come to Batangas port during the holiday season. The case of long queue at the gate of cars going to Calapan was inconsistent with the fact that at least one boat departed with many vacant slots. 2 Could it be the PPA’s guards deliberately held up many cars so that one shipping line will have less revenues, then allow the cars to come in for the other shipping lines to earn bigger revenues? 3 The coast guard also practiced typical bureaucratic behavior at Batangas port. Having standing passengers inside the boat at this season is expected as all the buses that come in have excess, standing passengers in them. Besides, the weather was fine, no signs or forecast of big waves or weather disturbances affecting the route. 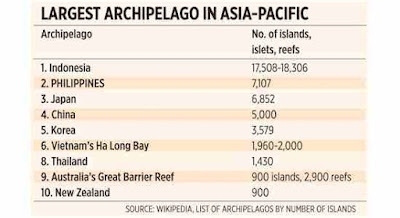 4 The Philippines is an archipelago and many people rely on inter-island shipping for their mobility. Government authorities should become more passenger-friendly, business-friendly, and not impose unnecessary prohibitions and regulations that slow down the mobility of goods and people. Bienvenido S. Oplas, Jr. is the head of Minimal Government Thinkers, and a Fellow of the South East Asia Network for Development (SEANET). The benefits of free trade and trade liberalization, unilateral or bilateral or multilateral, is maximized if it is coupled with investments liberalization. Allow freer movement of goods and commodities, then allow freer movement of capital and labor, entrepreneurs and workers, employers and employees. Vietnam (and China) is a good examples of this. It is socialist, true; the Communist Party is a political monopoly, but it allows freer trade of goods and freer mobility of capital. 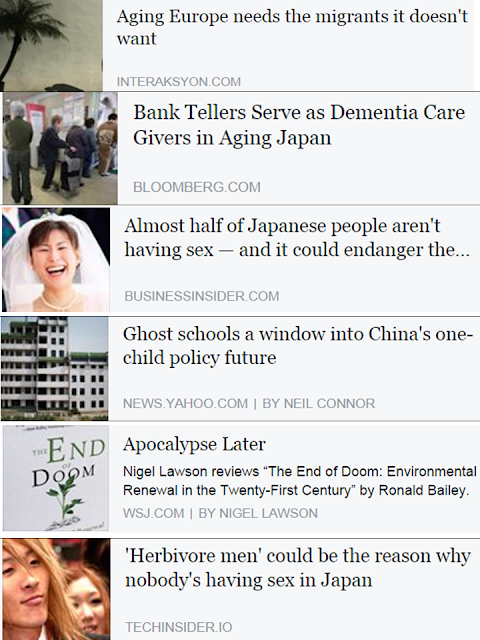 See these news reports for instance. 1. The lifting of ownership limit in Vietnam is not absolute of course, but still a good development overall. "The announcement gave few other details, although it said industries such as banking that are covered by separate rules would keep ownership limits at 30 per cent." 3. "Foreign investors of a number of high-tech investment projects in Vietnam have decided to increase the investment capital and expand their production activities to timely grab the opportunities that FTAs create when they come into effect. LG Group is another case. Its initial investment capital was $300 million to build a factory in Hai Phong. However, it then decided to increase the capital to $1.5 billion. Samsung in its export-oriented investment strategy announced its increase in investment capital by $3 billion in November 2014. 4. "Indonesia is now offering a tax reduction of between 10 and 100 percent for up to 15 years to firms investing a minimum of Rp 1 trillion ($71.5 million) in certain industries, the finance ministry said in a statement on its website on Monday. The tax break can be extended for an additional five years if companies obtain permission from the finance minister. Previously, the tax break was up to 10 years and if companies qualified, they could obtain 100 percent relief. 5. "openness to trade almost always results in high attractiveness to foreign investments and all the opportunities they bring -- technological, financial, managerial, and market access. Clear examples are HK, Singapore and Chile. Also the socialist economies China and Vietnam that allowed certain degrees of economic freedom and the market system." 2. ERIA (Economic Research Institute for the ASEAN) paper in 2008, "Investment Liberalization and Facilitation: Contribution to the ASEAN Economic Community Blueprint", 15 pages. Performance and Challenges: Investment Liberalization", 27 pages. 4. The major concerns of foreign investors in many countries. "According to the World Bank, Vietnam already attracted 8.9 Billion in FDI in 2013 and is moving to relax its foreign ownership rules. 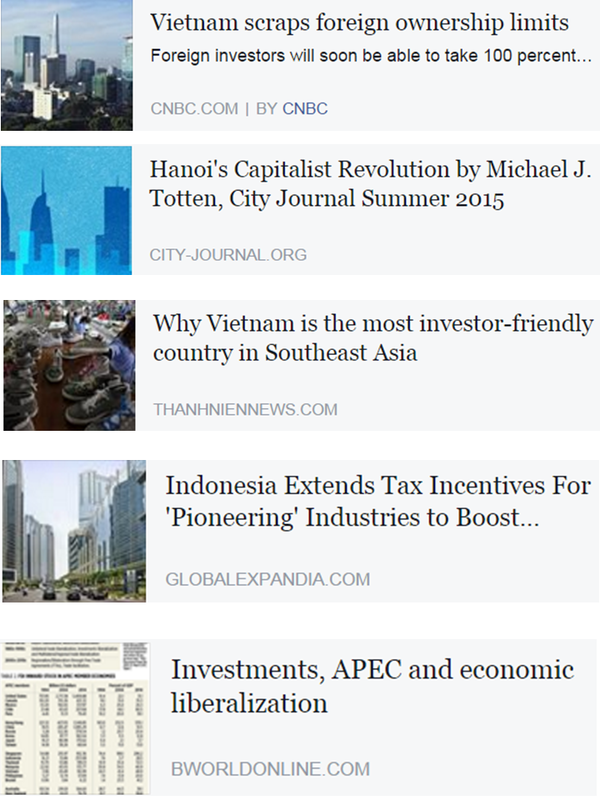 Vietnam’s Prime Minister, Nguyen Tan Dung recently, signed a decree lifting their 49% foreign ownership limit on publicly listed companies. Once the decree becomes effective later this year, 100% foreign ownership in most public companies will be allowed except for some sectors covered by specific laws or related to national security. The move will make Vietnam among the most open to investment in the region, positioning it to be even more attractive to foreign investments. Lots of food almost everywhere here in the Philippines, other countries, in celebration of family reunions and the holiday, Christian season. 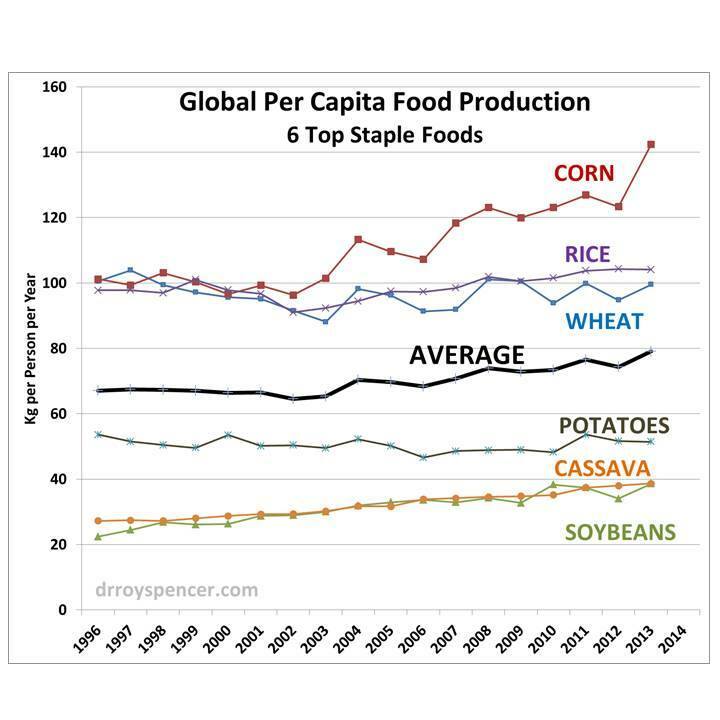 A world of rising... famine, or abundance? There is more food per capita now, and more in the future. The prophets of doom and alarmism may consider findinng other more useful jobs. Also from Dr. Spencer, March 18th, 2014. Another chart, by regions and continents, 2000-2009. 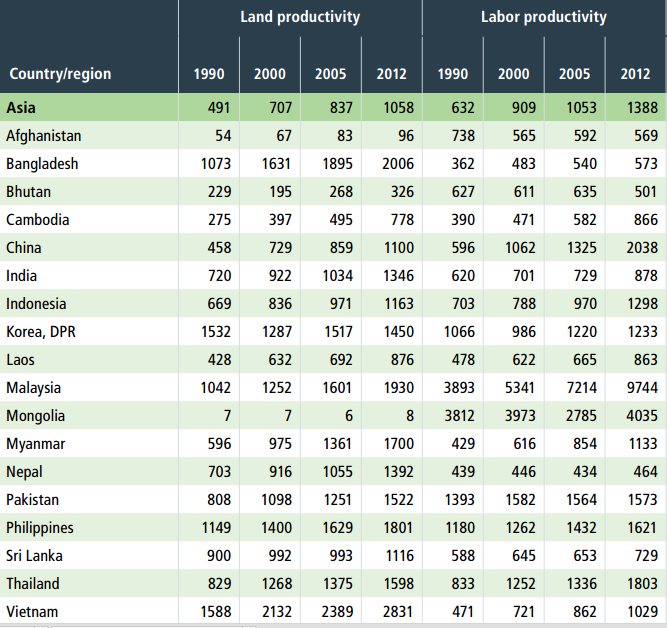 Land productivity is agricultural gross production per hectare of agri land. Labor productivity is agricultural gross production per economically active person in agriculture. 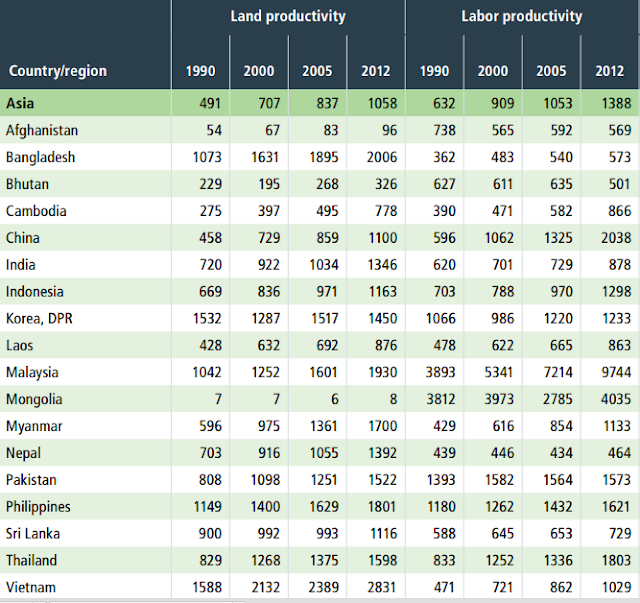 In Asia, they are steadily rising except in Afghanistan, Bhutan and North Korea. Data is from Table 6, Global Food Policy Report 2014-2015, by the International Food Policy Research Institute (IFPRI). The figures are even more impressive, much larger in some MidEast countries than those in Asia proper. 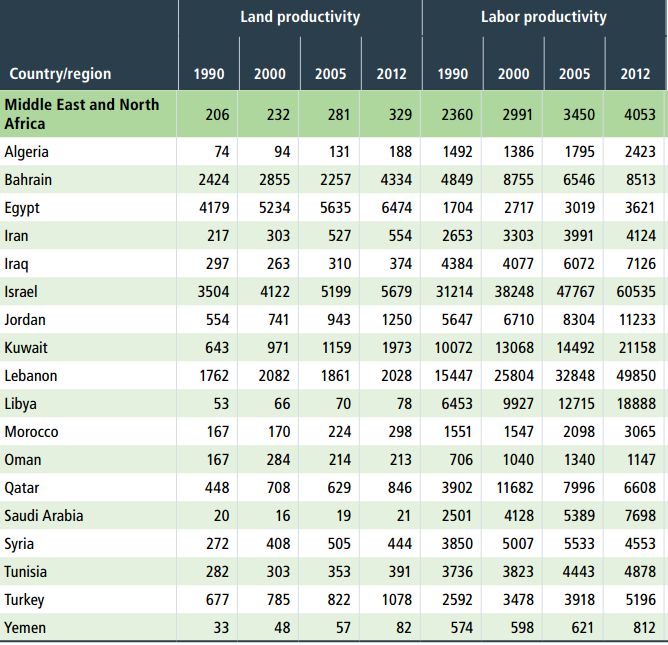 Note the numbers for Israel, Egypt, Bahrain and Lebanon. (1) "Journalists know that alarmism attracts readers. An article in the British newspaper the Independent titled, “Have we reached ‘peak food’? 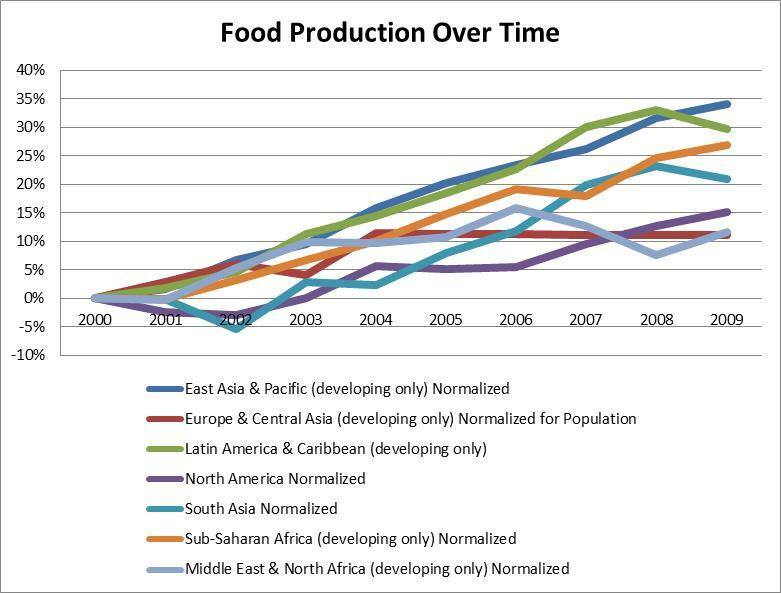 Shortages loom as global production rates slow” claimed humanity will soon face mass starvation. 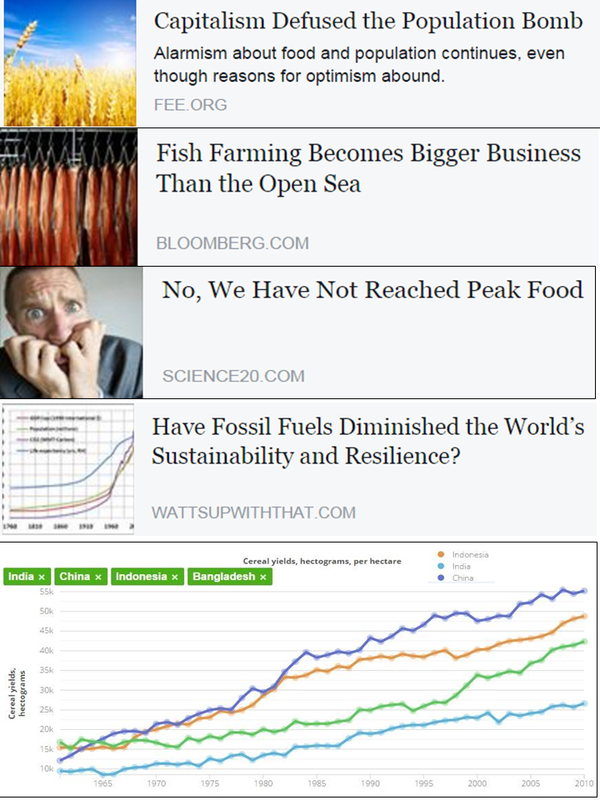 (2) "For the first time, the world is eating more fish from farms than from the open sea, spurring billions of dollars of takeovers as one of the largest food companies seeks to capitalize on rising demand. Yes, we have entered the period of rising productivity and prosperity. Governments and NGOs of alarmism should step back from more regulations and interventions in various innovations in food production, storage, marketing and distribution. Innovation and competition among players, big and small, plus civil society volunteerism can address problems in distribution to the most vulnerable and poorest sections of the population. 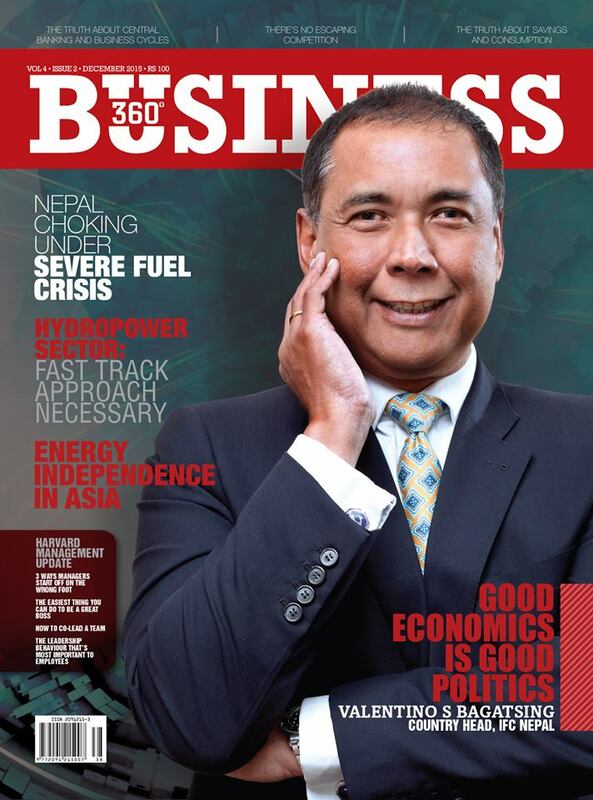 * This is my article in Business 360 magazine in Kathmandu, Nepal, December 2015 issue. Energy independence is a virtue that a country must pursue. And this independence can mean two things. 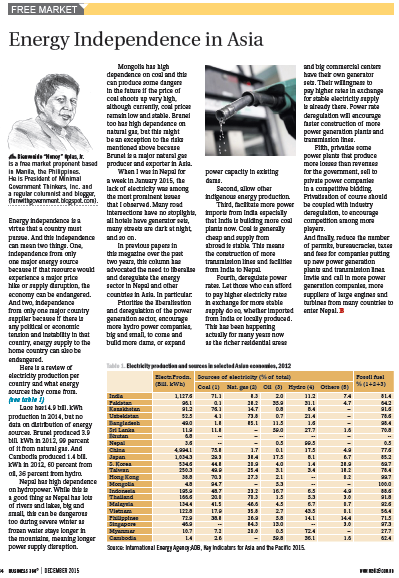 One, independence from only one major energy source because if that resource would experience a major price hike or supply disruption, the economy can be endangered. And two, independence from only one major country supplier because if there is any political or economic tension and instability in that country, energy supply to the home country can also be endangered. 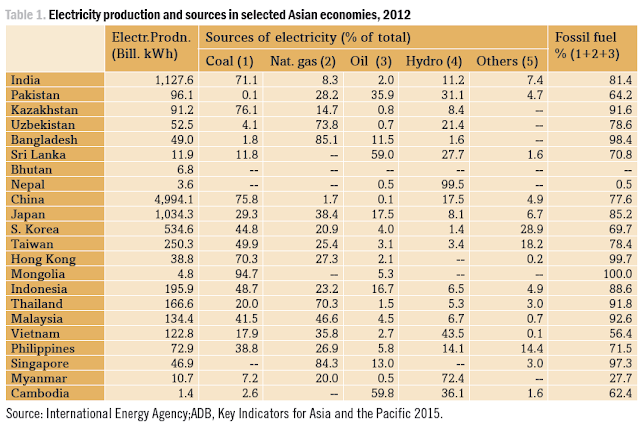 Here is a review of electricity production per country and what energy sources they come from. Laos has14.9 bill. kWh production in 2014, but no data on distribution of energy sources. Brunei produced 3.9 bill. kWh in 2012, 99% of it from natural gas. And Cambodia produced 1.4 bill. kWh in 2012, 60% from oil, 36% from hydro. Nepal has high dependence on hydro power. While this is a good thing as Nepal has lots of rivers and lakes, big and small, this can be dangerous too during severe winter and frozen water stays longer in the mountains, meaning longer power supply disruption. Mongolia has high dependence on coal and this can produce some dangers in the future if the price of coal shoots up very high, although currently, coal prices remain low and stable. Brunei too has high dependence on natural gas, but this might be an exception to the risks mentioned above because Brunei is a major natural gas producer and exporter in Asia. When I was in Nepal for one week in January 2015, the lack of electricity was among the most prominent issues that I observed. Many road intersections have no stoplights, all hotels have generator sets, many streets are dark at night, and so on. Prioritize the liberalization and deregulation of the power generation sector, encourage more hydro power companies, big and small, to come and build more dams, or expand power capacity in existing dams. Second, allow other indigenous energy production like coal power if there is sufficient amount of coal that can be mined and extracted within Nepal. Third, facilitate more power imports from India especially that India is building more coal plants now. Coal is generally cheap and supply from abroad is stable. This means the construction of more transmission lines and facilities from India to Nepal. Fourth, deregulate power rates. Let those who can afford to pay higher electricity rates in exchange for more stable supply do so, whether imported from India or locally produced. This has been happening actually for many years now as the richer residential areas and big commercial centers have their own generator sets. Their willingness to pay higher rates in exchange for stable electricity supply is already there. Power rate deregulation will encourage faster construction of more power generation plants and transmission lines. Fifth, privatize some power plants that produce more losses than revenues for the government, sell to private power companies in a competitive bidding. Privatization of course should be coupled with industry deregulation, to encourage competition among more players. And finally, reduce the number of permits, bureaucracies, taxes and fees for companies putting up new power generation plants and transmission lines. Invite and call in more power generation companies, more suppliers of large engines and turbines from many countries to enter Nepal.